Northern Manhattan Arts Alliance’s annual public art projects series in Upper Manhattan in collaboration with Leanne Stella, founder of Art In FLUX, and NYC Parks, presents The New Bench. Artists were asked to examine the bench as a social construct, challenging ideas around parks and communal places and how communities co-exist within these spaces. The three NYC-based artists selected each had very different take on the concept but share a playfulness in their responses. 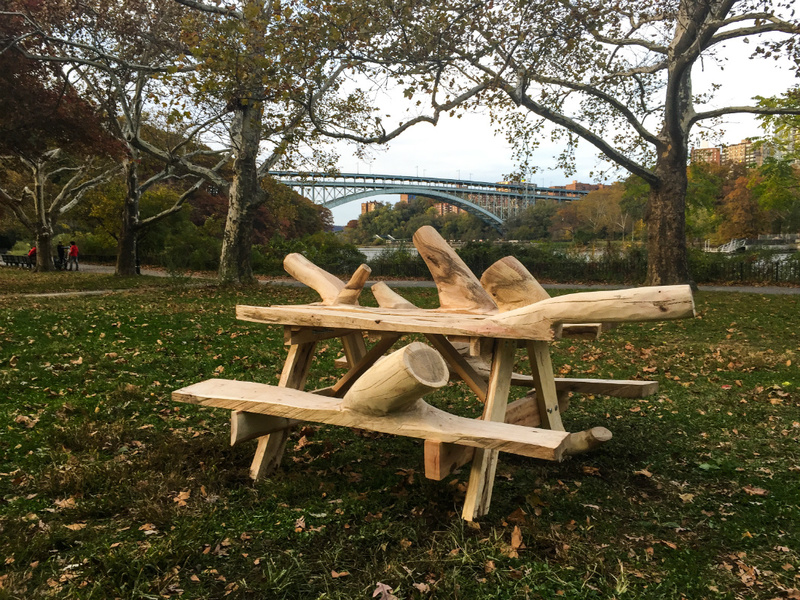 On view through April 30, 2018 at the Northern end of Inwood Hill Park (enter at Indian Road and 218th Street). Suprina’s installation titled In Someone Else’s Shoes is a 5’ high shoe that one can sit in, on, or under and imagine what it’s like to literally and figuratively be in someone else’s shoes. 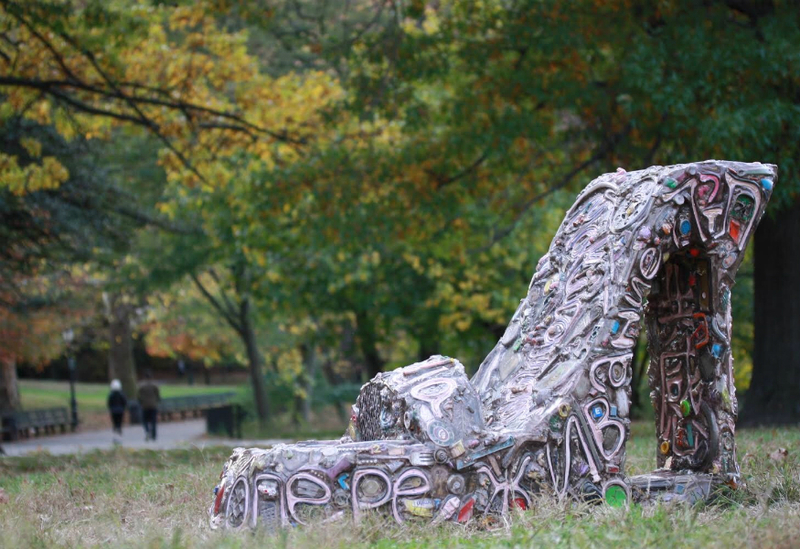 The surface of the shoe is a mosaic of objects that any of us might toss away but also binds us together. Viewers and sitters are encouraged to explore the surface with sight and touch to find objects with which they or a fellow sitter might personally relate. Suprina’s finesse with found objects comes from her work as a sculptor and prop maker for clients such as Annie Leibovitz, Apple, Bloomingdale’s, Fortunoff and the Macy’s Thanksgiving Day Parade. Her artworks deal with the human condition and social issues and incorporate detritus, castings, modeling, and painting. She has created a number of public art projects including the DNA Totem, FLUX Art Fair 2016 and Circle of Intention, Figment NYC 2012. Suprina made a splash in 2013 when by the County Sheriff deemed thirty-two of her sculptures installed in the Morristown courthouse dangerous to the public. Sam Holleran presented On The Record(s), a celebration of Northern Manhattan’s rich musical culture and an exploration of New York’s iconic ‘records in a milk crate’ image reminiscent of the DJ parties of the ‘70s and ‘80s. 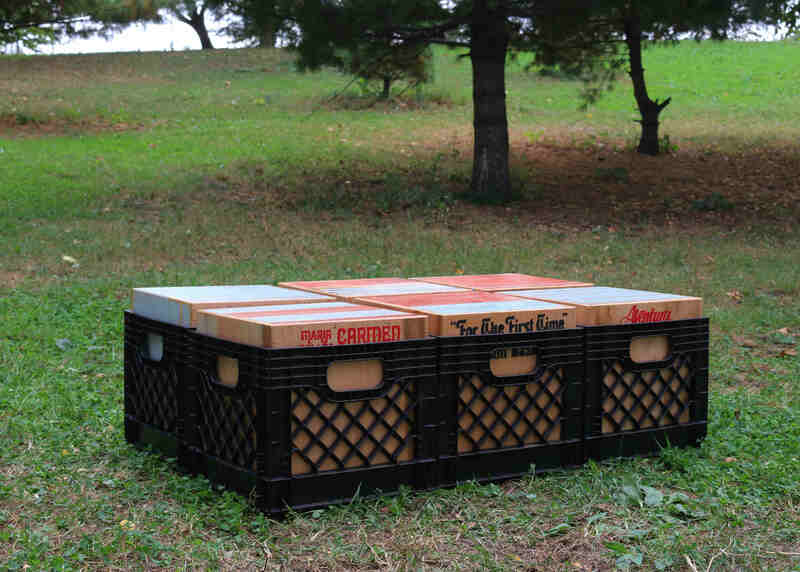 On The Record(s) joined together six milk crates full of ‘records’ into a bench large enough for three to four people to sit comfortably on each side, making it a natural pop-up area to discuss music, sing, or just hang out. The variety of musicians and groups represented on the album covers was intended to create musical cross-pollination between different communities and generations. Unfortunately this project was only short lived in the park. It went missing one week after installation. It will continue to live with an online presence at www.nomaanyc.org. Sam Holleran is a writer, interdisciplinary artist, and educator investigating topics in graphic culture and urbanism. He has worked with the Center for Architecture, Hester Street Collaborative, the Design Trust for Public Space, and the Center for Urban Pedagogy (CUP). He has created public artworks in collaboration with numerous city agencies, community groups, and nonprofit organizations in Manhattan, Queens, Brooklyn, and Staten Island. The Jones Part II is part of a body of work that explores camouflage as a means of assimilation into social environments. The work mimics a park picnic table constructed from rough-hewn fallen trees. The profusion of branches appear static and unclear, as if they are either growing from the wood or disintegrating. The branches prevent the picnic table from being used, instead offering a reflection on our relationship with nature as a material resource and the setting of social interactions. Hugh Hayden is a sculptor creating visceral experiences that transform perceptions of familiar concepts via both object making and interactive culinary installations. Whether through the lens of camouflage or culinary implements his work explores the underlying infrastructure, relationships and systems of social interactions. Hayden has participated in artist-in-residence programs including Workspace at the Lower Manhattan Cultural Council, the Emerging Artist Fellowship at Socrates Sculpture Park, and the Glenfiddich Artist Residency Program in Dufftown, Scotland. Hayden holds received his B.Arch from Cornell University and is currently enrolled in Columbia University’s Visual Arts MFA Program. With support from the Partnership for Parks Inwood Parks Grant, made possible by Columbia University.